It was only after we had become farmers ourselves that we jumped off the fence in the organic debate. For years, with four small kids and reams of conflicting advice, it seemed hard to justify the exorbitant cost of buying organic produce. So, why do it? For us it is a no-brainer. We saw first-hand how chemical fertilizers and sewerage sludge are indiscriminately dumped on crops, how pesticides are freely sprayed killing every living creature in their wake and how we were willingly popping those same nasties into our mouths. A little herbicide in your honey… mmmh…. A dash of weed killer in your oats…. Delish… I think not. We wouldn’t knowingly eat or drink these toxins and yet we do so every day. It is a choice really. It is important to know what is in your food and to trust where it has come from. For example, to comply with Australia’s strict quarantine laws, all imported garlic on our shelves has been sprayed with methyl bromide and often to achieve that white colour, it is bleached. Methyl bromide is a highly toxic fumigant and pesticide. It is a major environmental hazard and is banned in many countries. I know it’s hard to prioritise when you are whizzing through the supermarket trying to get the chores done as soon and as cheaply as possible, but who would knowingly eat that? 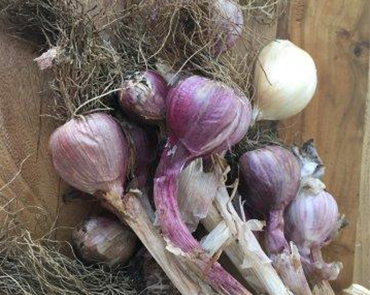 Local, organic garlic has colour, each bulb looks different and it tastes nothing like those bleached bulbs. Do a taste comparison for yourself- you will never look back. So why are organic goods more expensive? You’d think that with the reduced pesticide and chemical bill, we’d be cheaper which is not the case. So not the case. With our farm it is easy to explain why organic is more expensive. First of all, we do everything by hand. Weeding, planting, harvesting and packaging. Here in Australia labour is much more expensive than sprays and takes longer. As they say, time is money. There are no growth hormones used in organic farming so that can take longer too. We also don’t spray our produce with preservatives, so they have a shorter shelf-life. Organic certification is not cheap or swift. For us, it is a long, arduous, and on-going process with a lot of paper work and boxes to be ticked. We are audited every year and pay membership fees. To say we are proud of our certification does not quite cover it as it took a lot of blood sweat and tears to get there even though we started from a totally organicbase. It would have been much easier and cheaper for us to grow huge fields of one crop, dump chemicals into the soil and spray with pesticides. But in doing that we would have stripped the soil and we take the role as custodians of our ancient land very seriously and choose to enrich the soil naturally, replenishing it with minerals and healthy bacteria. We use natural composts and grow healthy pest and disease resistant plants. Our grove has a happy family of guinea fowl dealing with the bugs and when the beetles run rampant Mother Nature calls in the troops. At the moment, we have flocks of ibis reinforcing the work of the guinea fowl. Yes, a spray would be easier, quicker and much cheaper in the short run but for us it is not worth it. So, why organic? Do a little research yourself. Be curious about where your food comes from. Ask questions like what are the wheat bins are sprayed with? Think about how your food has travelled to you and when it was actually harvested. My advice: Grow what you can on your own and when you can’t, buy local and choose organic because it is better for the environment and you.